SHINNIHON KOGYO CO., LTD. has established overseas bases also, so as to respond flexibly to the customers' needs on overseas local procurement. 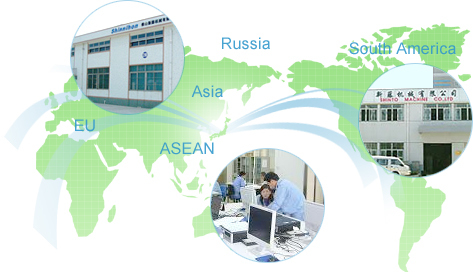 We offer services at overseas locations also for design, component processing, assembly, adjustment and verification, as well as for production start-up. The services we offer are of the same quality as in Japan. Our local engineers offer after-sales service and follow-up, wit the quality and service earning the loyal trust of our customers. We will continue striving to win greater trust with global business development in view.